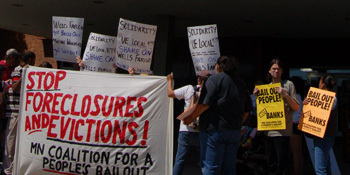 Minnesota:	March on Banks Demands Stop Foreclosures and Evictions | Fight Back! Minneapolis, MN - “You got bailed out, we got sold out! Stop foreclosures now!” was the rallying call during a protest here June 13 as a crowd of 75 people surged to the doors of a US Bank branch on Lake Street. Minneapolis police officers blocked the doors of the bank building, calling in more squad cars, which arrived with sirens blaring. The protest and march was organized by the Minnesota Coalition for a People’s Bailout. It called on banks and mortgage companies to stop forecloses and the displacement of homeowners and to stop evicting tenants from rental properties that have been foreclosed upon. The march then proceeded east on Lake Street to US Bank, in company with appreciative honks and shouts from cars and passersby. US Bank has received $6.6 billion in TARP, the federal bank bailout, yet it continues to foreclose and evict local families. State Representative Jeff Hayden, a Democrat from south Minneapolis, compared the current foreclosure crisis to the crack epidemic of the 1980s. He pointed out that removing longtime residents from their homes was destroying the culture and history of the community. Minneapolis city councilmember Elizabeth Glidden, who was pushed the city council to pass a resolution against evictions, also addressed the crowd. Tom Lenius, before presenting a ‘notice of default’ to US Bank, said, “The banks are in the habit of sending notices of default to the people. Today, the people of Minneapolis gave notice to Wells Fargo and US Bank that they are in default of their obligations to ensure that their activities do not negatively impact the communities in which they do business.” Then the crowd went up to the doors of the bank.